Social Media: A Passing Fad or Bigger than TV? The era of mass media introduced a lot of changes in how businesses communicate with customers. It has also had a huge impact on society, as Marshall McLuhan noted: media such as TV and radio would shrink the globe into a “global village“, a term he coined in his book Understanding Media (1964), which I briefly reference in the video. So what about social media? Will its effect on society and, more specifically, on business communications be a passing fad or will it have a greater impact than the era of mass marketing? Here is my riff on that question. Please let me know your thoughts on the subject. Note: This post is cross-posted from the Radian6 blog where it was originally published. We have spent this past month discussing the ins and outs of listening. Please join us next Thursday, October 29th at 2:00 PM (EST) as we discuss the different types of listening – brand, competitor, and opportunity – what types of conversations to listen for, and some simple tips for basic engagement and response in social media. Join Amber Naslund, Radian6’s director of community, as we talk best practices, examples and take your questions. We can’t wait to chat with you, so bring along all of your stories and questions about listening and engagement! The video speaks for itself. It is a tongue-in-cheek story starring Radian6’s VP of marketing, David Alston, that pokes a bit of fun at country singer Jay McLean’s attempt to become famous by writing a song which picks on “Convenience Store Chain” that just keeps running out of … well… I won’t spoil it for you. The message is clear though: listening to customers and engaging early can often avert a crisis or growing negative conversation about your brand. Let me know what you think of it as David is looking for feedback. Words are powerful, aren’t they? In fact, words can act a lot like brands. When you hear a word, it conjures up an entire mental picture that is shaped, in part, by the culture and conversations around you. The meaning of certain words can also change over time as culture redefines them. When you hear the word “listening”, what comes to mind? Does your mental picture of “listening” look like a unidirectional & mostly observational activity or does it conjure up a picture of a two way conversation? Does listening require you to say something? We talk a lot about the importance of a company developing the practice of listening (to the social web) for conversations about its brand. 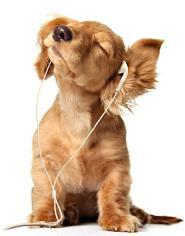 But what is listening? Consider the goal of listening: Is it primarily informational or is it also relational? When we think about this in the context of personal relationships between friends, do we set out to mainly gather information or do we see it as an important part of building the relationship? Most people perceive someone who listens as someone who cares. This type of listening has to be visibly demonstrated; it is not passive or unidirectional. It is two-way listening. Message reception is not enough; the listener must respond. One way data gathering is a stealth activity. You may be doing it to better listen to your customers and there is tremendous value in analyzing what you hear and acting upon it. Why stop there, however? Let customers see that you are listening by acknowledging them and strengthen your relationships too! On the surface, listening seems to be about receiving. However, conversational listening sends a message: you are important to us. A listening brand is an unmasked brand that is more personal and less institutional. As you listen & build trust, you will also increase the quality of the feedback you receive since people will share more openly when they observe true listening behavior. So many customers are accustomed to dealing with brands that do not listen. The bar is so low that a responsive brand that actually takes the time to respond to customers is remarkable. It is an opportunity to delight customers. The online community’s awareness that you are actively listening will influence the conversation significantly. Your very presence changes the dynamics. Let people know you are listening. If someone recommends your brand, say thank you. If someone asks a question, answer it publicly and you might even be answering several customers’ questions without knowing it. If someone complains, thank them for their feedback and seek to understand their experience. Ask clarifying questions. Apologize if the situation calls for it. Then go even further and be a conversation starter. Ask open ended questions and learn. You will get to “hear” a lot more feedback when people know you are listening and that you genuinely want to hear what they have to say. Remember Peter Senge’s BestSeller: The Fifth Discipline – The Art & Practice of the Learning Organization? Senge’s book focused on why the learning organization matters. I think my book (don’t hold your breath) would focus on why the listening organization matters. The Sixth Discipline is conversational Listening - “The Art & Practice of the Listening Organization”. Besides, I have a thing for the number 6. What do you think? In the scheme of things, how important is the listening organization? What are the issues with it? In my previous post on social media measurement I highlighted the fact that the social web is a highly measurable medium. It is rich with metrics especially when it is compared to traditional media which produced only a few metrics to work with, like reach & frequency. In this post, I want to expand your “field of listening” and dive into a best practice that a brand can undertake: growing your Share of Conversation. Most marketers are already familiar with the more popular measurement of share of voice. If we want to measure share of voice in social media amongst several competing brands, we would compare the number of articles, posts, tweets, videos or images where a brand and its competitors are mentioned. This would tell us which brand is mentioned the most relative to its competitors and by what margin. If we measure the competitive share of voice between Tylenol, Motrin, Advil, and Aspirin, we can see that Tylenol has the largest share of voice among its competitors. You can represent it with the chart above (pick whatever time period suits your purpose). What is Share of Conversation? Most companies appreciate the value and importance of monitoring direct mentions of their brand and perhaps their competitors as well. The Share of Conversation concept is about opening your field of listening to focus on a broader conversation that is very important to your brand. What are the needs or problems that your product is setting out to help with? How do people discuss these needs or problems online? When these problems are discussed, how prominent is your brand in these conversations? Definition of Share of Conversation: It is the degree to which a brand is associated with the problem or need that it is setting out to help with. If you are Tylenol, you can broaden your listening to include the entire conversation about back pain, or headaches, or arthritis. These are all significant and distinct conversations that the brand is setting out to help with. What do arthritis sufferers talk about online and how prominent is Tylenol in that conversation? Let’s look at the overall conversation about Arthritis on the social web. It is a very active topic with well over 24,000 on-topic posts/articles published per month. When people talk about Arthritis, do they also talk about Tylenol? In this example, Tylenol’s current share of the Arthritis conversation is 1.7%. 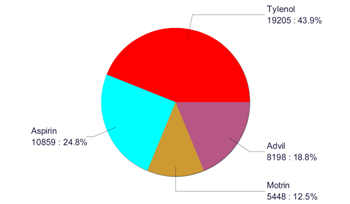 If we do a simple overall share of voice calculation between Tylenol and Aspirin, we will observe that people talk about Tylenol almost twice as much as Aspirin. However, when it comes to the Arthritis conversation, Tylenol is not as prominent as Aspirin, which currently has a higher (2.5%) share of conversation. Measuring share of conversation is simple. 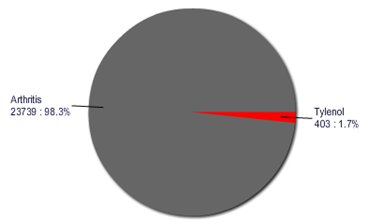 For a given time period, count the number of conversations which are on-topic for your given subject. In this example, we have just over 24,000 conversations about Arthritis. We then count the subset of these 24,000 articles which also mention Tylenol and then divide by the whole as outlined below. The easiest way to calculate this is to use a professional social media analysis tool (disclosure: I’m the CEO of Radian6), which will quickly let you visualize the results and also enable you to automatically track it over time to measure your progress. Why is share of conversation important? When people go looking for solutions, they will search online. They may start with a Google search or reach out to other Arthritis sufferers amongst social networks, forums or blogs. As a brand, it is unlikely that you can dominate all the top Google listings as well as all the other sources where users will turn to find information. The social web is not about controlling information anyway, it is about participation. With 24,000 on-topic arthritis conversations, the probability that they will land on your site in their search for answers is quite low. So you want to strive to have your brand associated with the conversation wherever they do land. Advertisers know the power of repetition (even though consumers typically don’t “trust” ads). When I hear something mentioned once I might dismiss it, but when I hear it repeatedly, particularly from trusted sources, I start to think there might be something to it. If Tylenol can successfully add value and become an insider to the Arthritis conversation, then it will have achieved much more value than any one-way message or ad campaign can achieve. The key is trust. Arthritis sufferers will trust each other far more than they will trust any corporate message, particularly an ad. If Tylenol can earn the trust of the community and grow its share of conversation, it will have achieved a valuable and difficult to replicate position. How to grow your share of conversation? Start by listening to the conversation. We already know that Tylenol is only associated with ~1.7% of the arthritis conversation, so we know arthritis sufferers are talking about something else. What are the hot sub-topics within the conversation? What are people buzzing about? This discipline of listening must become an ongoing process since conversations are constantly changing, in real time. The next step is to begin participating in the conversation. Consider where your company or brand can add real value to the specific topics that are important to the community (based on your listening above). Ask questions and seek first to understand. Then, contribute helpful content. This could be a white paper, e-book, blog post, or video which addresses questions that are frequently discussed. Listen for expressions of needs or causes that your content is designed to help with and reach out when appropriate. Ask questions designed to better understand the community’s needs and deepen your learning about arthritis sufferers. Through your participation, you will convey and demonstrate your brand’s passion for the problem and your willingness to invest in helping them. As you participate, your brand association with the topic will grow and you will become a trusted insider in the community. A brand that personally engages and participates becomes less institutional and more human - an “unmasked brand” which is easier to know & trust. It is easy to to have a significant impact even if you want to start small. What if we started with an initial investment of a few hours per day for one person (and a professional listening tool, of course, so that the person’s time is spent in conversation and not in the administrative tasks of searching, reporting, etc.). As a first step, we will narrow the broader arthritis conversation to focus on the 250 most influential sites. For this topic, the top 250 sites generated approximately 3,000 conversations (and 11,000 comments) about arthritis in the past month which is ~100 per day – a relatively manageable volume for one person to tackle part time. Our resource would first focus on these conversations, taking the actions I described above (listening, learning, adding value, participating, etc.). How much visibility would this get? These top on-topic sites collectively had 78.8 million unique visitors last month and close to 1 billion page views so that is a lot of overall exposure. To come up with an ad-equivalency benchmark, I used JP Morgan’s average CPM forecast for 2008 of $3.44 to calculate that a “theoretical” banner ad campaign on these sites would cost up to $3.4 million (if you wanted to cover every visit to every page/post). Many of the ad exposures would be wasted since only a percentage of the total conversation on these sites is on topic. Your direct conversational engagement efforts, however, are always 100% on topic so none of your investment is wasted. Plus, the value of direct engagement in the conversation is much higher and longer lasting than any ad impression. An ad campaign is fleeting. If you want to generate the same exposure next month you have to buy it all over again. Investing in becoming an insider to an online community and generating positive word of mouth builds up and accumulates over time. It is conversation capital. It is an investment that pays dividends for months to come. Does this make sense? Was this helpful? Would you like to try this for your brand? 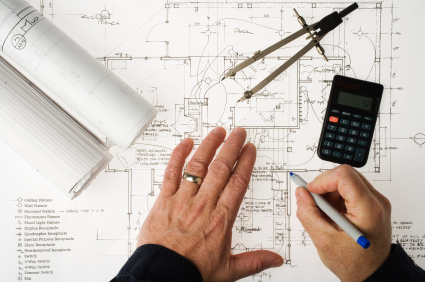 Mike Trap wrote a great post today, “Measurement is for engineers. We just need consensus” that builds on my previous post on on social media measurement. It is an important addition to the conversation and so I’m highlighting it here for anyone interested in following this topic. All we need is “consensus.” We need to discuss and agree on metrics which - whatever their shortcomings in the assessment of metaphysical truth - are at least consistent from program to program. That is the foundation of a “market,” as distinct from the “hobby” that most social media is today. What do you think? Must we now accept the underlying variability of social media and the disparate marketing initiatives operating within it? Or is moving beyond that to consistent if flawed measures the next step in the development of this pre-adolescent medium? Thanks so much for discussing my post and adding to this conversation. You make some great points. I quite agree with you that not every social media program is destined to be different. Things will undoubtedly converge toward best practices over time(i.e. as consensus forms on the best approaches). 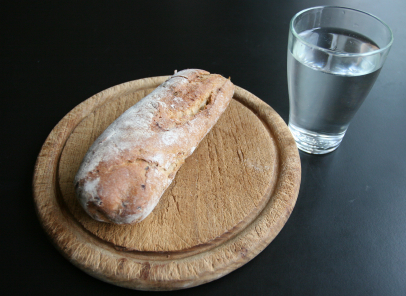 My point on the “bread & water” concept is twofold: a) consensus is much easier to achieve when there is little to choose from in the first place and b) the quality of our measurement can be higher with more and better metrics. With a greater abundance of metrics, programs, etc., comes a greater diversity of opinions from the experts and, therefore, a more difficult path to consensus. Some will even want to claim ownership of a certain approach all to themselves. The good news is that we have much more in the way of metrics to evaluate the effectiveness of our initiatives/efforts than we ever have. I like your last two questions. The underlying variability of initiatives using social media is a current reality. Must we accept it? My sense is yes and no. On the one hand, I think and hope that we will see a growing consensus in some areas in terms of the adoption of certain consistent measures. On the other hand, we will also continue to see variability because we will continue to have innovation, experimentation, and the medium itself is constantly changing (giving us new metrics & tools), which is very different from traditional media. I’d be interested in your thoughts on this - what do you think it will take to instigate such a consensus? It seems to me in the past that the problem started because something could not be measured at all and then an answer appeared, albeit imperfect, that turned darkness into light. So we all ran with it as the “best answer at the moment” - consensus. Our current situation, however, is not the absence of metrics, but rather the abundance (and diversity) of metrics. Also, with traditional media, there was a center stage, a central owner - institutions that owned the medium. You had to work with them and that also had a standard setting influence. The social web, however, has no center stage and the medium is not under institutional management, but operates as a community with no sheriff. All that said, I do think you are right on where we will end up. I’d be interested in how you think such a consensus can or will form? Thanks for the great post, Mike and for adding your insight to this conversation. It is easy to predict that we will be talking a lot more about social media measurement and ROI in 2009. The question of ROI becomes more important when there is a market transition from an established form or investment (i.e. traditional media) to an emerging form like social media. Even though the ROI of current or traditional investments may be no less certain, the test is always a higher one to justify a change. This has many people asking, “How do you measure social media?” There has been a lot of valuable conversation about this topic already. Kate Niederhoffer has assembled a really interesting set of predictions for measurement in 2009 in her post: Go Back: The Future of Measurement. I’m glad Kate invited me to join the group, but unfortunately I didn’t have enough bandwidth to participate in the conversation prior to her publish date, but of course the conversation will continue. Here are a few of my thoughts on social media measurement in 2009. First let’s look at traditional media and its measurement. For a brand or corporation, traditional media has primarily held a single role or purpose, to disseminate one-way information to potential customers either through advertising (paid media) or through news coverage (earned media). For print media, for example, the industry has largely converged on two intermediary metrics: reach & frequency. You basically know how many people receive the publication, how often, and perhaps some information about the reader demographics. Everything else has largely been a derivative of these two metrics. The same comparison can be made for online advertising and the metrics of page views and unique visitors. I labeled the traditional metrics as intermediary because they do not directly measure or represent results associated with the end goal (ex: what awareness did it create, what sales did it drive, what new relationships did it establish, what actions did it incite, etc.). Did the industry really land on these metrics as the chosen standards because they were the best ones for determining ROI, or were these the only things we could measure so we had to work with them? Because this traditional medium is not directly measurable, we don’t know what “actually happened” as a result of our paid or earned message. Did the message get noticed, or generate conversation, or cause word-of-mouth propagation, or increase brand advocacy, or was it largely ignored? My first law of social media measurement: If all we have is bread and water, then we will learn to make do with bread and water. It is easy to agree on what we need to prepare for dinner when there isn’t much to choose from. There is not much room for innovation or creativity in preparing a meal with only bread & water. So, bread and water, it has been. Social media measurement today is moving us beyond bread & water. Social media has several key/unique characteristics that are different from traditional media. First, it is a multi-purpose communications medium. In many ways, social media is less like traditional media and more like email or the telephone/communications network in terms of its multiplicity of purpose. It isn’t restricted to sending one-way messages nor is it limited to a single purpose. Furthermore, the social medium creates many artifacts, or digital breadcrumbs, that are directly measurable as people participate. It isn’t just a medium with a message, but it is also a medium which contains and records actions. The same questions that I posed above are now much easier to answer: did my message get noticed, or generate conversation, or cause word-of-mouth propagation, or increase brand advocacy? 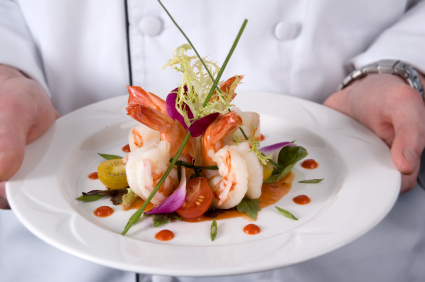 Social media measurement is like gourmet cooking. We now have plenty of high quality ingredients to work with. There would not be a gourmet chef profession if we only had bread and water to work with. Is there a “standard measure” in the gourmet food industry for how to make a good Fois Gras or Duck D’Orange? No. Of course, it isn’t hard to recognize gourmet cooking, nor is it hard to detect bad cooking. However, the experts will continue to innovate, experiment and advance the art… and, they will argue vehemently about the precise measure of good Fois Gras. Social Media measurement is like gourmet cooking because the social web produces a vast and growing array of metrics that can be gathered and combined in various ways to extract meaning, insight, and measure the effectiveness of one’s investments & efforts. The list of ingredients is growing all the time: comments, inbound links, votes, views, likes, bookmarks, favorites, tweets, re-tweets, social graph connections, etc… countless social breadcrumbs that are directly measurable both on page (directly connected to your content) and off-page (located in other places, but related to your content) plus they can all be measured temporally adding that important perspective of time: velocity, transience, sustainability/stickiness, etc. Additionally, the types of business functions & endeavors that brands can pursue using the social web are as numerous and diverse as the metrics available – it isn’t just an advertising medium. Measuring the ROI of your investment in providing customer support using the social web is very different from measuring the ROI of your efforts in influencer outreach. As any industry matures there will certainly be a growing alignment on some best practices & common measurement approaches, but the art (and the conversation about it) will continue to improve, innovate, and change. Let’s take the measurement of influence as an example. Perhaps Technorati started things off for blogs with a measure they labeled “Authority” which is based on inbound links to blogs (directly measurable). Technorati counted them up over a specific time span and called this Authority. As the social web matured and the discussion continued, many experts started to agree that this simple measure, albeit useful, was too narrow. Steve Rubel called it dead in a July 2007 post discussing a new system for measuring online influence, “The practice of measuring online influence by links is truly dead”. The metric didn’t include a total view of an influencer’s activities on multiple social networks, for instance, and blogs are now just one part of the whole of social media. It also did not include the concept of topical influence and so it worked more like a popularity metric and could not be used as a true measure of influence for a given topic. It did not include the many other metrics that have emerged and become effective markers for inclusion in a measure of true influence. Does a blogger who has more unique commenters, engagement, and two-way on-topic conversations in the comments of his posts have more influence? This was not part of the original equation. Innovators and experts will continue to propose new formulas for measuring influence and will continue to add new social metrics as they emerge on the web. Influence, of course, is just one of many types of metrics as well. Will we ever land on a “standard measure” for influence or any other standard measurement in social media that some are calling for? I don’t think so. Call this a 2009 prediction if you like: there will never be a single standardized metric for measuring social media. We have forever moved beyond bread and water. And this is good news! The complexity and diversity of the raw ingredients available means that amazing things can and will be created by skilled individuals. The industry will generally swarm around some best practices, but the art and applied science of measurement will continue to increase in complexity and effectiveness. Now the experts can use this ever growing set of metrics, and apply them skilfully to the specific business objective for which the investment is being made in the first place. As my friend Katie Paine, a five star Master Chef of social media measurement, always reminds everyone: you have to start with your specific business goals. She says in this post on social media measurement, “There can be no standard because there is no standard goal for communications. (…) So establishing a standard metric for such diverse goals is clearly a waste of time.” Katie, will you be posting your 2009 predictions this year? Early in my studies I was drawn to engineering because I liked the idea that engineers were focused on the practical application of science: making things work. While a science class might measure, for example, the temperature of water and argue over its precision (i.e. it is -10.21543 degrees Celsius) an engineer will first asks why you are measuring it? If I want to make ice, I don’t need to know if the water/ice temperature is -10.215 or -10.225 degrees, I just need to know that it is below freezing and -10 is good enough. The same goes for social media metrics. If my business goal is to determine who I should be building relationships with online regarding a specific topic or which communities are most active about the topic, then it is less important to fuss over the precise influence formula, scores & rank for influencers #4 and #5, since I will reach out to both of them anyway. It is more important that my measurement includes the broadest set of social media properties, media types, content coverage, and the most comprehensive set of metrics such that my resulting scores and lists of influential people and communities are not too narrow, potentially leaving off important communities of influence. In fact, I may want to tweak the influence formula, giving certain metrics higher or lower weightings in order to look at things from a few different angles if it fits my purpose. If you are interested in 2009 predictions, Peter Kim has aggregated some excellent predictions from several experts I know & respect like Jason Falls, Todd Defren, Rohit Bhargava, Chris Brogan, and Charlene Li. You can download this PDF version of the predictions from his blog. I thought I would share this, mainly because I found it funny, but I also because I think is makes a really interesting statement & observation on a social phenomenon happening online with respect to transparency. I am a big fan of transparency, by the way, but I am also a fan of Microsoft’s umbrella social media policy - “Don’t be stupid”. Is there such a thing as too transparent? 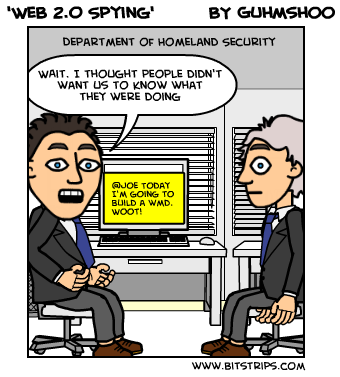 Also, be sure to click on the image and check out bitstrips.com for more great cartoons. The kind folks at BrightTalk invited me to try out their platform and conduct a live webcast for their Conversational Marketing Summit a few days ago. BrightTalk is a self-serve platform to deliver live and recorded webcasts. I found it quite easy to use and the people at BrightTalk were very helpful too. I often get questions about the “how to” of listening or monitoring your brand in social media. With this presentation I wanted to focus more on the questions, “what should I listen for?” and “what can I do with what I find?”. So I would like to provide you with a few ideas for the types of opportunities that exist beyond just listening for mentions of your brand. 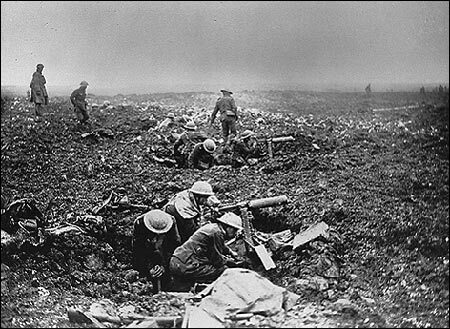 The image above is from the battle at Vimy Ridge in France, where British & French troops had suffered over 200,000 casualties. In 1917 the Canadian troops were tasked with the re-capture of Vimy Ridge, a highly strategic site held by the Germans. 30,000 Canadians attacked at dawn on Monday April 9. Three days later the ridge was under Allied control. This was a turning point battle in the war but at a great cost with 10,602 wounded and 3,598 killed. We honor your sacrifice… and remember. 66,665 Canadians died in WWI and 44,893 in WWII.